It can be hard to tell the story of a place almost nobody knows existed. However, I’ve cobbled together accounts from a town founder’s diary, the newspapers and other accounts to share this history of Sulphur Springs, a settlement in the Saratoga township of Douglas County in the Nebraska Territory from 1857 to 1877. By this time merely an addition to Omaha, this 1887 map shows Sulphur Springs Reserve, streets, and the lots for sale by the one-time rivertown. In 1844, the US Congress passed the Federal Townsites Act. Speculators from the East Coast decided this would let them make millions from the settlement of the Indian Territory, including the land that became Nebraska. Crossing the river from the Iowa Territory that year, initial settlers were rejected by the federal government for the next decade. However, these same land hounds went back East and told speculators about the opportunities waiting for them. They sold speculation on the idea that when the Nebraska Territory opened, settlers would need to buy supplies from towns that needed to be built. Moving into the area before the Territory was official opened to homesteaders, the Federal Townsites Act of 1844 allowed town promoters to purchase 320 acres, usually for about $400. Shareholders would buy land around the new towns, claiming homesteads of 160 acres for themselves. These land speculators were given the legal titles to the land when the Nebraska Territory opened, and expected to make riches off lots they sold to settlers. They also sold shares in the town to other speculators. It was a gamble though, because if their towns didn’t pan out these speculators would lose their shirts! In 1854, the Nebraska Territory opened to speculators and homesteaders. It was a wide-open land filled with wild hopes and fantastic dreams. For wealthy land speculators, the western shores of the Missouri River were ripe for the picking, with plans to build docks, towns and cities from the southern boundary to the far northern reaches of the river. One of those was a corporation of men from New York state, and their company was called the Sulphur Springs Land Company. Established in October 1856 as part of the Nebraska Territory land grab, the Sulphur Springs Land Company was meant to make a fast buck for its founders. Establishing their initial development along the Missouri River that year, they named it from the spring located behind town, which they believed would make them rich men. According to Beadle’s diary from his time in the Nebraska Territory, there were about a dozen shareholders in the Sulphur Springs Land Company. Taylor G. Goodwill was the chairman of the executive committee of the Sulphur Springs Land Company, and he had the original vision for the Grand Hotel built around the sulphur springs. Goodwin owned the actual sulphur springs and probably named the town Saratoga after the popular resort in Saratoga, New York. LeRoy Tuttle was the company treasurer and a banker from Cooperstown, New York. He worked for the Western Exchange Fire and Marine Insurance Company in Omaha, one of the first wildcat banks chartered by the Nebraska Territorial Legislature. Other shareholders included Thomas Hart Benton, Jr., James Comey Mitchell, William Young Brown. This group owned several “wildcat” banks in the Nebraska Territory intended to make fast money for the investors, including the Western Exchange Bank in Saratoga, the Fontanelle Bank, the Bank of Florence, the Bank of DeSoto and the Bank of Tekamah. The rest of the shareholders included A. F. Salisbury, Edwin Patton, Addison Cochran, C. B. Smith, and Samuel M. Owens. Taylor bought his 160 acres, including the sulphur springs, in 1854 from William Clancy. After that, he formed the Sulphur Springs Land Company to expand the township and gather investment money to build his town. In addition to the initial 320 acres claimed for the townsite, each investor claimed 160 acres nearby, and the township eventually added up to 2,300 acres. This extended from present-day Carter Lake to North 42nd Street, from Locust street north to Fort Street. Within that townsite, there were three separate places platted: Suphur Springs, the Town of Saratoga, and West Saratoga. This is a satellite image of present-day Sulphur Springs with numbers designating important historical and modern places, including 16th and Locust, the Shoreline Golf Course, and the sulphur spring. This group’s town was called Sulphur Springs. Laying out lots along the riverside and extending over the cliffs lining town and onto the wide plain above town, the town founders staked out lots, built docks just south of the Saratoga Bend in Sulphur Springs, and encouraged development by selling land cheap and recruiting settlers from Council Bluffs and Omaha. Located north of Omaha and south of Florence, Sulphur Springs was named for a natural spring flowing from the cliffs east of present-day North 14th Street at Pinkney Street. There were several streets laid out in Sulphur Springs by a surveyor hired by Beadle, as well as the initial number of lots. A modern flyer for the historic Grand Hotel in Saratoga, Nebraska Territory. In March 1857, the Sulphur Springs Land Company named a New Yorker from Buffalo to be the town manager and the company’s chairman to expand their efforts. Erastus F. Beadle had come to Omaha in summer 1856 to study the area and see if he wanted to get involved in the fledgling company. Returning home that season, he came back to Nebraska in April 1857 as an investor and employee of the Sulphur Springs Land Company. It took him 21 days to travel from New York to Nebraska. Serving as the company manager, his job was to supervise the drawing of lots for the shareholders, promote the town, and give away the free lots to people who would build on them. Beadle was supposed to earn a free lot and money for his job. Beadle immediately set up a new townsite separate from Sulphur Springs that he called Saratoga Springs. With the first steamboat arriving at his dock on April 19, 1857, Beadle started a warehousing business, built a large warehouse along the river, and waited for money to come pouring in. Promoting Saratoga actively, he became friends with Bird B. Champman, publisher of The Nebraskian newspaper, and placed ads in the paper frequently. He was also acquainted with Nebraska Territory Governor Thomas Cuming, who owned lots in the Saratoga township. The company set aside 256 lots for churches, schools and settlers who had to begin building houses or businesses by July 1, 1857. Beadle was initially very optimistic about his prospects and the possibility of the company striking it rich on the land. The Saratoga Claim Club was organized in 1857 to help settlers protect their claims within the townsite. Given any threat from pre-empters or people who’d steal other peoples’ land, a group of men would gather together with their weapons and enforce the initial claim on the land–or the claimant they liked the most. This was pioneer justice, and was often biased and prejudiced. However, Beadle liked its effectiveness. During the summer, $100,000 was dedicated to building a hotel called the Trinity House. Designed to cover an entire block in Saratoga, the building was finished on August 12th. Renamed the Central House when it opened, there was an opening gala that was “by far the most brilliant party ever given in the Territory,” with 200 guests served a ten course dinner complete with claret and port wine, along with a magnificent ball and wonderful music by a good band. However, by the end of August 1857 Beadle was bummed. The company wasn’t selling lots quick enough to make money, and there were rumors from the East Coast about money problems about to hit the nation. In a diary he kept, his enthusiasm sounded drained and he quit working for the company. He homesteaded on a section of land near present-day South 108th and West Center Road, creating a farm and building a house. He didn’t stay there though, and eventually sold off the land he wrote about so poetically. His name for it stuck though, and today we still call Beadle’s Rock Brook Farm by its original title. Late in September 1857, there was a run on the banks throughout the eastern Nebraska Territory. A financial panic spread across the young United States that year, and settlers came pounding on the doors of these wildcat banks that were started within the few years before then. Unfortunately, there wasn’t a lot of capital behind these banks, and when the run started a lot of settlers found themselves holding script from these banks that didn’t have anything behind them. Script was locally-produced money made by the banks, and exchanged with the settlers for their hard cash. It was treated as currency within a lot of the towns where the banks were located, as well as beyond those local banks. When these banks’ customers came knocking repeatedly for money that didn’t exist, the bankers took the cue to close up shop and run away! Each of the five banks listed were tied together by their investment group, which was the Sulphur Springs Land Company. When the banks folded, the company folded. Their towns, including Saratoga, West Saratoga and Sulphur Springs, all ceased to exist formally at that point. Sure, people still lived there and the land was still on maps, businesses did business and the area kept growing–but there was no business behind all of it trying to drive profits and grow the place on purpose. Only two boats ever stopped at Sulphur Springs. There were no stores or supply houses to serve the emigrants coming through the area though, and with the Panic of 1857, an independent town government was never established. The Panic also forced the exit of some of the most active promoters, including Beadle. There were no real town promoters or fiscal supporters left there after 1857. This is a drawing of a map of Sulphur Springs, Nebraska Territory, by Adam Fletcher Sasse. However, Sulphur Springs didn’t just whither up and die after Beadle left. Neither did Saratoga or West Saratoga. Sure, the Sulphur Springs Land Company ceased to exist, making legal claim to the lands within the Saratoga Township feeble at best. However, people still lived there, businesses still worked, enterprises still happened and the future still arrived. In addition to the warehouse that Beadle built and sold, by 1858 there was a dock, a lumberyard, a brickyard and other enterprises that happened in Sulphur Springs. In September 1857, the United States government appointed a postmaster to the Saratoga Post Office, but it closed in early 1859. In February 1858, a committee lobbied the Nebraska Territory Legislature and got permission to found the University of Nebraska at Saratoga. That never amounted in anything though. Saratoga was host to a big celebration on July 4th, 1858, with music by the Omaha Brass Band. A lot of events were held at the Central Hotel. Starting that same summer, the Douglas County fair was held southeast of 24th and Ames Avenue into the 1870s, and the Nebraska State Fair was held in town intermittently, too. In the 1860s, the Saratoga School became a major fixture in the area, hosting events, elections, and more. The Saratoga Congregational Church was established by 1869, and a church was built in the early 1870s at North 25th and Ames. It stood until the 1920s, and was eventually used by Lutherans and as a public library. This is an 1863 pic of the Brownell Hall in Saratoga, Nebraska Territory. This was originally the Grand Hotel, and stood into the 1880s when it burned down. The Center Hotel went bankrupt in 1861. That year, the Episcopal Church opened a school there. For four years, girls in grades 1 through 8 came from across the area to board at Brownell Hall. They went to classes, created social activities, and planned for their futures. Several times annually, the school held picnics and socials; wagons came from Omaha City, Florence, Fontanelle, Blair, Bellevue and Council Bluffs to visit; and donations came in from regional benefactors. The students’ favorite campground for weekend excursions was supposedly at the foot of the bluffs east of present-day North 14th Street. When Cyrus Tator was executed at North 14th and Pinkney in 1863, the girls supposedly stopped camping in the haunted spot—which was near the actual sulphur spring. In 1868, the school moved to downtown Omaha, leaving Saratoga in the imaginations of girls. Stories poured out of threats from nearby Native American tribes; long days of baseball between Saratogians and Florencians, Omahans and others; and the struggles of living in a pioneer boarding school with no chimneys in their rooms, no running water near the building, and few amenities to make their lives easier. That all ended when the school moved into Omaha. Since it continues today as the Brownell-Talbot Academy, Brownell Hall may be the most famous vestige of Saratoga’s history. However, it wasn’t the only one. In the 1880s, the Omaha Driving Park hosted buggy races and other events. This picture shows the buildings on the site, including stables, a gazebo and the grand clubhouse. Not pictured are the grandstands that sat 1,000 people. Located west of N. 16th and Commercial Avenue, these buildings stood through the 1898 Trans-Mississippi Exposition. Starting in 1875, the county fair grounds near Sulphur Springs became known as the Omaha Driving Park. In May 1883, Buffalo Bill held the premier performance of his Wild West show there, and for years after special events were held at the track. In 1873, there was a United States Supreme Court trial affecting the Sulphur Springs. In the case of John A. Smiley v. Sampson, two early owners of the land who sold to the Sulphur Springs Land Company took the former owners to court, contesting they never actually sold their land to the company, and that the company wasn’t legally sound to own title to the land. Presenting homestead certificates signed by President Abraham Lincoln in 1864, the pair eventually won. There was another U.S. Supreme Court trial involving the Sulphur Springs Land Company in 1872 in the case of Frank B. Myers v. John T. Croft. In both cases, the solubility of the company is in question, and in neither case was it proven to be real. Title signed to Chester O. Samson by President Abraham Lincoln in 1864 for the land that comprised Sulphur Springs signed by Abraham Lincoln in 1864. In 1877, a raging flood cut off the Missouri River from Sulphur Springs. It was replaced immediately with a puddle about 1/3 of the current size of Carter Lake. A few years later, another flood inundated the area and expanded the water, which became known as Cut-Off Lake, then Lake Nakoma and then Carter Lake. Before the City of Omaha pondered building a publicly-financed water works, there was a lot of talk around town about private companies building water filtering and distribution places around the area. In 1879, these companies’ searches reached a fever pitch and they started scouting locations, and one of these was Sulphur Springs. The costs for constructing the water works there would’ve been significantly less than elsewhere, but eventually it was concluded that it wouldn’t work because of the marginal condition of the water. The City Water Works Company finished the Florence Water Works in 1880, and the facility still serves MUD customers today. In April 1882, the Omaha Daily Herald lamented the condition of the springs. “It is with great pity that the sulphur springs north of the city do not receive more protection against the ravages of time.” Apparently there was a house built at the springs that was rotting apart, and the hundreds of people who used to come to the springs everyday weren’t coming anymore. “All it lacks is a rusty iron stove to make it resemble a Council Bluffs streetcar,” which meant it was the WORST. The paper wanted the site cleaned up and renovated to encourage people back there to enjoy it. 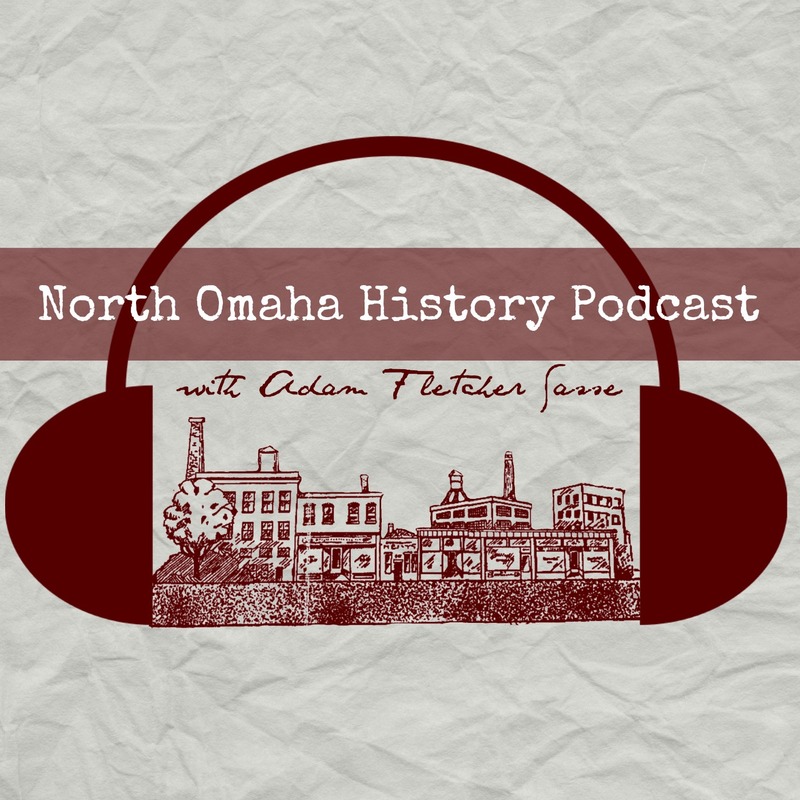 In the early 1880s there was a bottled water fad that struck Omaha. A bottling company was set up near Sulphur Springs, and that sulphur springs water was tapped, bottled and sold around the city. However, it was cut off when railroads came through. A year earlier, in 1885, the Belt Line Railway was laid north from Nicholas Street to Locust, through the Sulphur Springs land and onto Florence following the old Saratoga Road up the bluff towards North 16th and Commercial Avenue. This line ran for the next 70 years. Right after it was finished, the mother railroad of the Belt Line, the Missouri Pacific, built a roundhouse just north of Locust inside Sulphur Springs. That same year there was a malaria infestation hitting Omaha. As a response, city engineers made a ditch running from Fort Omaha to Sulphur Springs to push stagnant water into the lake. The caption reads, “This is a picture of the boat crew of the Omaha Rowing Association at Cut Off Lake, Omaha, as they appeared in 1884. The men are Allen Touzalin, Dr. F. N. Conner, James Brown, Dr. Wilcox. The Omaha Rowing Association was launched in 1885 from the old Sulphur Springs docks. With their first regatta happening on Cut-Off Lake in October, the crews brought out “many wagons full of spectators,” with the viewers including many women and men making wagers on the crews. A boathouse was eventually built there that stood into the 1930s, when it was rebuilt further north by the Works Progress Administration. However, the Omaha Rowing Association didn’t continue after that, until it was resurrected in the 1990s. The continued existence of the rowing boathouse on Carter Lake today may said to be originated with the 1885 club though. Then there was yet another new vision for the sulphur springs. This 1886 article from the Omaha Bee pitted Sulphur Springs against Manhattan Beach on Lake Manawa for the best resort development. In 1886, the Omaha Bee pushed the Saratoga Sulphur Springs in a battle against Manhattan Beach on Lake Manawa in Council Bluffs. While several of the properties out on East Omaha Island developed well, I think its honest and easy to say that Sulphur Springs didn’t ever really match up to Manawa. In 1887, a pioneer real estate mogul and lawyer named A. J. Poppleton petitioned the City of Omaha to close all the streets and alleyways in Sulphur Springs. The City granted his request, and with that the sun set on the Old West land speculators’ dreams. No more docks, no more industry and no more hopes for the future. Sulphur Springs was over. Extending from N. 16th to the bluffs, from Locust to Manderson, the Bluff Tract was essential to the 1898 Trans-Mississippi and International Exposition. In 1898, the Omaha Driving Park and hundreds more acres next to Sulphur Springs hosted the most grand event Omaha ever knew: the Trans-Mississippi and International Exposition. After a grueling battle over where to site the event, Saratoga won out and a royal fairgrounds was built. Covering blocks of land acquired by Omaha banker Augustus Kountze in the 1860s, the land skyrocketed in value after it was covered with faux Greek temples made of horse hair and lathe. With new hotels, theaters, taverns and more, the intersection of North 16th and Locust thrived. Called the Bluff Tract, the Sulphur Springs Addition was packed with a giant teeter totter and the scenic railroad, among other attractions. There were several buildings on the Bluff Tract, including the state buildings, the Horticulture, Apiary, Poultry, and other buildings, and a section of the Midway. There was sewage, water systems, and electricity installed across the area, too, along with trees, sod and flowers. The Belt Line Railroad served the Bluff Tract excellently, as well as carrying general passengers to the rest of the Expo, too. After the 1898 Trans-Mississippi Expo, homes and businesses filled the area above the Sulphur Springs site, west of the cliffs, and the history of the Sulphur Springs was nearly forgotten entirely. By 1900, the entirety of the Saratoga township including Sulphur Springs was nearly absorbed into Omaha. That year, a dozen squatters were pushed out of the site by the Omaha Police Department. Although north of the notorious Squatter’s Row, these homes had reportedly been on the site for at least a dozen years. Apparently, they lost a court case and left the land after they were repeatedly harassed by railroad police and agents for the landowners. A huge fire ravished the old Sulphur Springs area in 1910, including a roundhouse and a shack by the old springs. Bodies were found near that shack in a potential crime I couldn’t find more information about. In 1911 a new railroad roundhouse was built in the Sulphur Springs addition for the Omaha Road. It was destroyed by the Easter Sunday Tornado of 1913, and rebuilt a few years later. That same tornado smashed through the rest of the area too, and left a lot of destruction among the enterprises in and around Sulphur Springs. The Missouri Pacific roundhouse was located in the Sulphur Springs Addition, too, and the Union Pacific ran a spur from the North Yards around the north side of Carter Lake for industrial work there, too. The Sulphur Springs Addition was home to three railways through the years. Located on the north end of Sulphur Springs, this was some of the railroad infrastructure in the area. Shown here are the Ames Avenue Bridge of the Illinois Pacific, and trains going to the MoPac roundhouse. The seemingly endless count of railroads and railroad infrastructure through and around the town included the Illinois Central Bridge over Carter Lake (demolished); the Union Pacific Bridge over Carter Lake (demolished); the Locust Street Causeway over Carter Lake (demolished); the Locust Street Viaduct (demolished); the Omaha Road Roundhouse at 35 Carter Lake Shore Dr (demolished); and the Missouri Pacific Roundhouse at 35 Carter Lake Shore Dr (demolished). The history of Sulphur Springs, Nebraska Territory seems to have ended before it could ever get going. Today, the area is an industrial wasteland poisoned by toxics from a century ago, railroads that dumped oils and creosote and just left them behind when they bailed on the land. Despite recent attempts to sell it as prime real estate, the large chunk of land still sits empty, waiting for a vision. There are no acknowledgments of its past, either. Not a plaque, few mentions in books, and barely any appreciation for what was. Another lost history in Omaha.